Makin' Hay: Ridge Vineyards boasts the largest straw-bale construction in the United States. I was supposed to write a "fun fun fun" article on Ridge Vineyards. Me, I'm no wine writer, so I figured I wouldn't go too deep, that I'd just have a good time with it. But in my digging to unearth amusing tidbits about Ridge, my research spade kept turning up "history" and "philosophy," "sustainability" and "character." Fun? Not so much. But it turns out my pardner has a few bottles of Ridge, and he set me up with a mini vertical tasting of my own (Lytton Springs Zinfandel blends '95, '99 and '03). How about: "ripe," "rich," "berry," "plummy"? That's pretty fun. The history of Ridge begins at its first vineyard, Monte Bello in the Santa Cruz Mountains, which produces mainly Cabernet. The vineyards were planted and the winery built by an Italian doctor in the 1880s. When four Stanford Research Institute graduates purchased this vineyard in the early 1960s and learned that the old vines and the particulars of the place (mineral-rich limestone soil, cooling sea breezes) made for a wine of distinctive flavor and character, they realized they had found something special and began to seek out other old-vine vineyards. They found what they sought throughout California, mostly planted to Zinfandel. Draper, a Stanford philosophy grad and largely self-taught winemaker in the hands-off European tradition, came onboard in 1969 and has been making Ridge wine ever since. Ridge employs no commercial yeast, no modern fermentation additives, no sterile filtering. Many of Ridge's vineyards are at least a hundred years old, their spread in Healdsburg being no exception. With the careful attention the grapes receive from the growers and winemakers, one can taste the character of these particular places, the terroir--maybe the same taste that local wine lovers enjoyed at the turn of the last century. Draper was one of the first American winemakers to champion this sense of character and place for the Zinfandel grape, and is considered largely responsible for shaping the Zinfandel we know today. Not so long ago, Zin was considered a second-class grape--a too-fruity, early-drinking, peasant table wine that would never age like one of the classic grapes. And if you're not a Zin fan, you might feel vindicated now that DNA testing has traced its ancestry to Croatia (not quite a sacred varietal from the red-wine holy trinity of France, Italy or Spain). In 2000, the existing winery was rebuilt, and is a testament to Ridge's values. The two-story building's 20-foot walls are built of straw bales faced with earth plaster made from the surrounding soil. It is the largest commercial straw bale structure in the United States, and apparently, in the building of it, some of the contractors found it challenging working with the relatively freewheeling straw balers. Picture the electricians and plumbers arriving on the construction site at the crack of dawn, cigarettes maybe dangling from some mouths, to find a team of at least 20 straw balers doing their morning yoga. The swathe of solar panels along its huge south-facing wall supplies the majority of the winery's electricity needs. The straw bales act as a super-insulator, creating something akin to an aboveground cave. The earthen plaster on the straw bales "breathes," allowing accumulated moisture in the bales to transpire. Making a building of this magnitude out of straw bales was by no means a cost-cutting measure; nor was finding salvaged oak for the floors, or using barrel staves from the old fermentation tanks for the tasting bar. 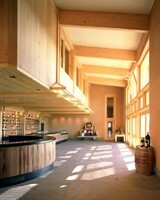 To keep the winery cool, Ridge employs a passive solar design. Extra-large overhangs shade the building in summer; high ceilings allow hot air to rise above the workers, patrons and wine. On summer nights, computer-controlled louvers around the building open to let in the cool night air while louvers in the cupola open to let trapped heat escape. As a result, no air conditioning is needed, except as backup in the barrel room. The philosophy in the vineyard, as in the winery, is to tread as gently as possible on the land that so much defines the flavor of the grape. Nutrient-rich topsoil is kept in place and augmented with cover cropping and grape pumice compost. In order to move away from using herbicides to control the weeds, Ridge now tills between the rows using a special tractor that senses the proximity of the vines and can swivel out of the way. For pest control, Ridge uses an organic mineral oil called stylet oil to control spider mites, and employs beneficial insects to fight other pests. Ridge uses recycled gypsum (a calcium amendment that aids in water absorption) salvaged from drywall at construction sites. They are light-handed with their tractor work to avoid the erosion that sends soil streaming downhill into the rivers, making it too muddy for salmon to spawn. In our world, there are increasingly more ways that we are out of touch with real things--things we can touch, taste and smell. Making wine can be a connection to these real things: the earth, the seasons, the sun. Ridge values this connection and invests in it, allowing its grapes to speak without interference; Draper says it's as if the land is expressing its character in the glass. Come taste. Drinking it is fun fun fun. On Saturday, May 20, Ridge hosts Bales and Blues, a day of wine, homemade seasonal food and Cajun roots music by Bay Area Cajun band the Aux Cajunals, featuring Berkeley mainstay Suzy Thompson squeezing the accordion and singing in a voice as rich as a Ridge Zin. Ridge Vineyards/Lytton Springs, 650 Lytton Springs Road, Healdsburg. 11am to 4pm. $25-$40; 21 and over only. Call 707.433.7721, or visit www.ridgewine.com.